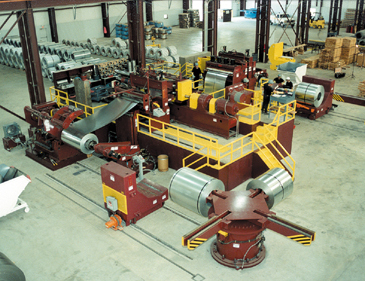 Houston, TX - Baldwin Steel Company, a multi-facility coil and sheet distributor and coil processor has installed a large high production coil slitting line in its Houston, TX, plant. 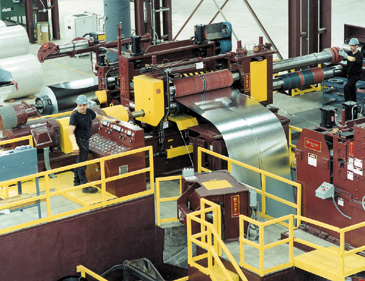 The slitting line, designed and manufactured by Braner/Loopco, Schiller Park, IL, is designed to process coated and bare cold rolled, and hot rolled pickled coils in sizes up to 80,000# x 72" wide, with coil diameters to 84". The line has the ability to slit mild and high strength steel coils in gauges ranging from .010" through 3/16" at line speeds up to 1,000 FPM. Line Configuration: The line is configured to produce tight tolerance superb quality slit coils throughout the product range. The "high pass line" eliminates equipment induced coil breaks and makes coil threading extremely fast because the strip is never "reverse bent" under load. Another benefit derived from the high pass line is that no "deflector rolls" touch the top of the strip, eliminating the possibility of surface scuffing critical surface coils. In addition, the high pass line configuration allows an "exit wrap roll" to be located in close proximity the Recoiler. This assures straight side wall slit coils from ID to OD. Operating Modes: Because of the wide gauge and product range, the Baldwin line was designed with three operating modes: tight line; single loop; double loop. Side trimming and surface inspection is accomplished most efficiently in the tight line mode, as is slitting heavier gauge hot rolled product. Multiple cut slitting of non-surface critical coils in medium gauges is done most efficiently in the single loop mode. The double loop mode is utilized for slitting light gauge surface critical coils because this mode eliminates slitter knife "skidding". Double loop also allows the strip to be slit under zero tension conditions that produces a cleaner slit edge on light gauge. In order to accomplish slitting in those three modes, large DC motors are utilized on the Uncoiler, the Slitter, and the Recoiler. Slitter Design: The Slitter is a quick-change "Turret" equipped with two 10.000" slitter heads. The Turret slitter is manufactured to precision machine tool tolerances and utilizes "shimless" slitter tooling that is lapped to within .000040", giving Baldwin the ability to produce precision tolerance slit coils. With clear access to the arbors during set-up (making re-tooling easy), and the ability to change slitter heads in about a minute, little time is lost to tooling changes.